Four Hidden Rules Card Games now available. Most of us take social rules for granted. Don't stare at people. When you get in an elevator, face the front of the elevator not the back. Don't keep talking about something when you see that the person you are talking to is bored. But children with an Autism Spectrum Disorder (ASD) frequently don't understand the social rules that seem obvious to everyone else. As a result they may be teased or socially isolated, and they grow up missing one of the most important aspects of being human - having good friends and intimate relationships. Dr. Shapiro, President of Childswork/Childsplay, has focused his company on creating new products for children with ASD, including four Hidden Rules card games. Dr. Shapiro explains: "A recent report from the Center for Disease Control tells us that nearly 1 in 88 children are diagnosed with a disorder on the Autism Spectrum. No one really knows why this number has so drastically increased, but we do know that we have to find new ways to help these children, and our staff is dedicated to finding creative ways to address the defining problem of ASD, poor social communication skills." 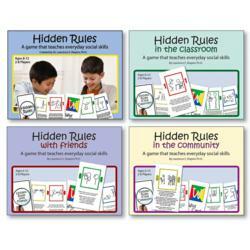 The Hidden Rules card games are for children ages 6-12. As they play, kids learn about the unwritten social rules, including why these rules are important to remember. The first Hidden Rules card game produced by the company was an instant hit, and they quickly went on to produce more games specific to the community, the classroom, and to common situations with friends. Childswork/Childsplay is the leading provider of play therapy resources in the United States, focusing on therapeutic tools used by counselors and family/child therapists to address the social and emotional needs of children and adolescents.